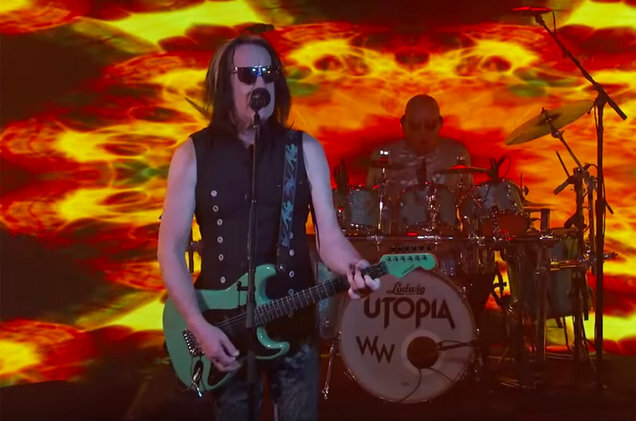 Todd Rundgren’s Utopia Rock Out ‘One World’ On ‘Jimmy Kimmel Live! – Cleopatra Records, Inc.
Todd Rundgren’s Utopia Rock Out ‘One World’ On ‘Jimmy Kimmel Live! Prog pop icon Todd Rundgren visited Jimmy Kimmel Live! on Tuesday night (July 9) to perform his 1982 hit single “One World” ahead of his North American Unpredictable tour with his long-running band Utopia. At 70, Rundgren gave a nostalgic performance of his 1992 hit with his signature pop bounce and urgent vocals that brought to mind late rock icon Warren Zevon. After 25 years in retirement Rundgren decided to get the band back together for a tour dedicated to their catalog of hits, which include such radio classics as “Love in Action,” “Set Me Free” and “Feet Don’t Fail Me Now,” as well as their more prog-leaning songs. Watch Rundgren and Utopia’s performance below.